Following the successful Brisbane event, the second Australasia reunion for BI staff was held towards the end of April 2003. Fine wather prevailed and by all accounts the reunion was a great success with all the myriad arrangements and the curry coming in for particular praise. Auckland was chosen after taking soundings at the Brisbane 2001 reunion, where there was a good deal of support for Auckland. Known as the City of Sails, Auckland is built on the shores of the Waitemata Harbour. The downtown area of the city is on the harbour's edge. 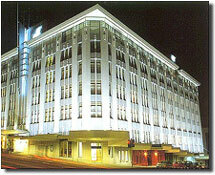 The hotel chosen is The Heritage (left), which is located on Hobson Street, virtually across the road from the Sky City Casino, and within easy walking distance of the waterfront and Americas Cup Village, as well as the city's main shopping area and the Maritime Museum. The hotel's facilities include pool, gym and a pleasant bar called the Muddy Farmer. Close by are several cafes, pubs and restaurants. Rooms are spacious and well appointed, all with en-suite facilities. The reunion dinner will be held in the Hotel. There will be a dawn parade and mid-morning service at the Auckland War Memorial Museum in the Domain for those who wish to attend. Sunday 27 April Curry lunch at the Mahatma Gandhi Centre, 145 New North Road. A coach transfer will be provided from the hotel to the venue but as some may wish to stay to socialise, attendees will make their own way back. Taxis are not expensive. For those in a fit state to walk, the distance is approximately two kilometres! The hotel and other operators require a deposit in order to confirm space. A deposit of $150 per person is required, which is refundable in full up until two months prior to the commencement date of the reunion. Residents of Australia and other countries should make enquiries at their local airline office or travel agent. It is possible that Mark Kenyon will be able to improve on air fares for Australian residents, so feel free to contact him with the details of what you have been quoted. Mark Kenyon can make flight reservations for New Zealand residents outside Auckland, but please note that the lower fares are payable WITHIN 24 HOURS of confirmation of flights and are NON-REFUNDABLE. Due to the rules governing most air fares, and the hotel�s cancellation policy, it is strongly recommended that you take insurance cover against unforeseen circumstances. New Zealand residents please note that there is a policy available for travel within New Zealand and for domestic cancellation only. We will not send out receipts in order to save on postage costs. Please check your bank or credit card statements. The duration of the Reunion is four nights. If you require a longer or a shorter stay at the Heritage in Auckland, please state the number of nights required on the registration form. Mark Kenyon will be pleased to make any additional arrangements for you if you intend spending more time in New Zealand either side of the Reunion dates. Small functions for specific interest groups can be arranged. These could include "Chantala", "Chindwara", troopships, educational cruise ships. If you are interested in a small group gathering, please state the subject of your interest on the registration form. We would point out that there may be an additional charge for any such function.